This was a impulse project. I've had the idea of a fitted back, colored chemise dress floating around in my head for some time now, but when I saw this fabric online, I fell in love and knew I had to make a dress from it. While white is the first color that pops to mind, tt seems shades in the lavender and mauve range were very popular for chemise dresses. 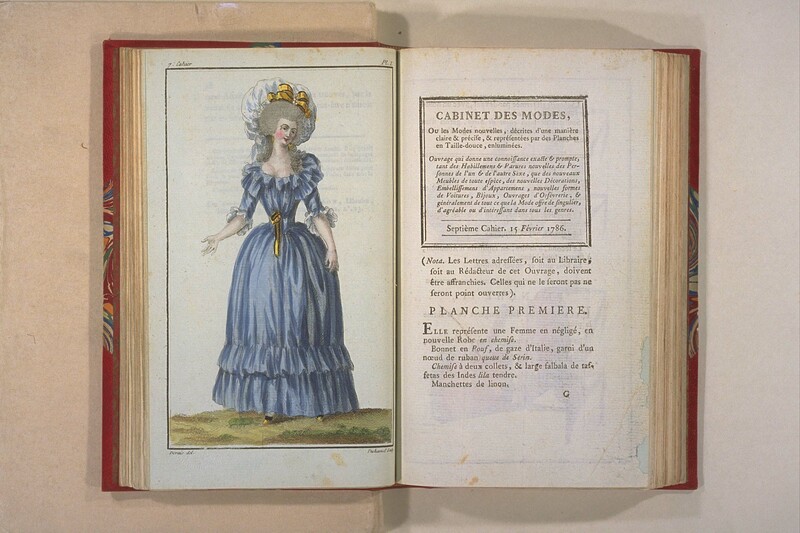 I found several fashion plates showing this color range and my fabric is almost an exact match with this Vigee le Brun self-portrait. Because of time constraints, the dress is mostly machine sewn with hand finished details (hems, ruffles, etc.) The back has shaped seams like a late 1780s dress, with the back skirt attached by gathers. For the front, I cut the shoulder strap and neckline into one long panel that runs the length of the front. This panel is attached to the back at the side bodice and skirt seams, as well as the shoulders. A drawstring channel runs from the top of the shoulder to the center front on either side, and the front waist gathers are only held in place by the sash. I'm wearing it with a straw hat decorated with vintage millinery ribbon and flowers, as well as my blue 18th century shoes , a brown sash and a little miniature for accessories.